Lush greenery surrounds the home at 3020 Garber St. Words to describe our latest Home of the Week: stately, classical, solid, enduring — and comfortable. 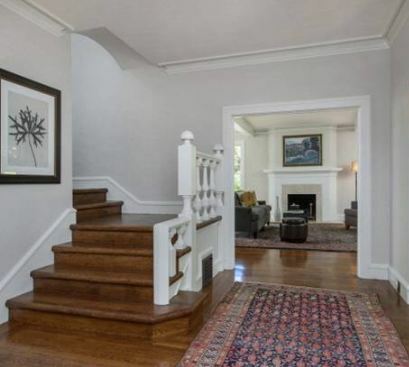 This Berkeley home for sale, at 3020 Garber St. in the desirable Claremont Court neighborhood, was designed in the Dutch Colonial Revival style by noted Bay Architect John Hudson Thomas and built in 1924. The formal entry is framed by Doric columns and an upper balustrade, and elegant arches inside strech across entrways to the cental hall and staircase. With six bedrooms, four and a half bathrooms, and a full basement, the home can accommodate a growing family and a variety of uses. Outside, a columned rear portico opens onto a lush garden. The artfully landscaped, one-third-acre is fully fenced for pets and play. Hardwood floors and graceful details accent the classical design. Learn more about 3020 Garber St.